The NewYork-Presbyterian Hudson Valley Hospital bi-monthly Farmers Market runs year round in the hospital’s Main Lobby. From April to November, the market is held twice a month. For sale from among 20 vendors participating in the season are fresh fruits, vegetables, herbs, artisan baked goods, selected crafts and gifts, and other items. EBT/SNAP customers are welcome and some farmers accept FMNP checks. Check our events page for exact dates and details. The Farmers Market is open from 10:30 a.m. to 3:30 p.m. In addition, from December to March, the Farmers Market is held once a month. For these dates, go to https://events.nyp.org/hudsonvalley. This year, NewYork-Presbyterian Hudson Valley Hospital is supplying each vendor with paper bags for purchased items. 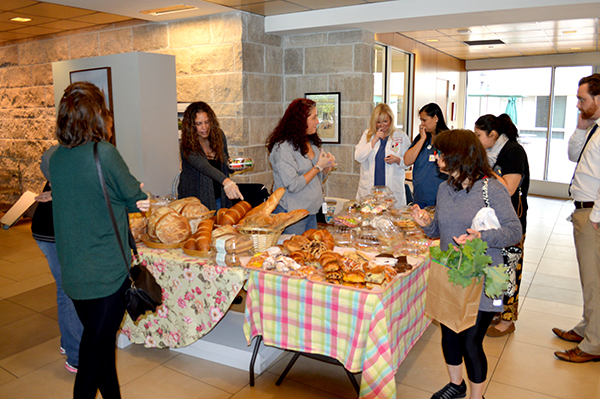 The Farmers Market is part of the Hospital’s Harvest for Health initiative, aimed at using healthful eating as a way to prevent chronic disease and positively influence patient recovery. For more information, including how to become a vendor, call 914-734-3797.